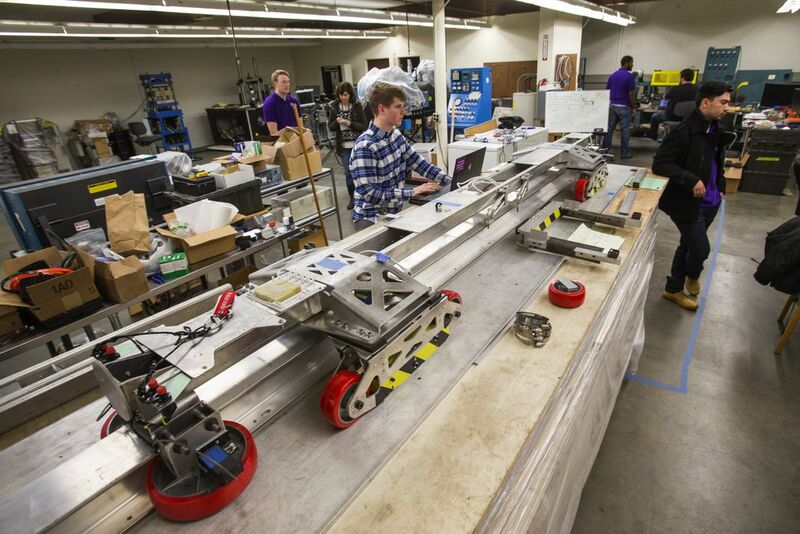 A team of University of Washington engineering students is competing in an international challenge to design a hyperloop pod — part of an effort to develop the dream of a ground-based transportation system that would go more than 700 miles an hour. Imagine a transportation system that could move you from place to place faster than a jet plane, without ever leaving the ground — a system that could take you from Seattle to Portland in just 15 minutes. In a chilly warehouse near Lake Union, a group of University of Washington students is trying to solve some of the engineering puzzles tied to inventor Elon Musk’s dream of a hyperloop, a theoretical new form of travel. 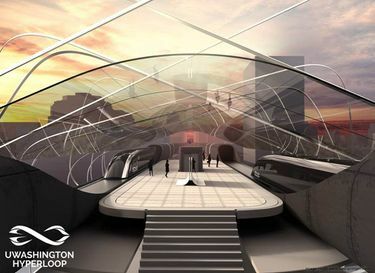 They’re among the 30 finalists in a collegiate competition to build a hyperloop pod — a capsule for carrying passengers in the tubes envisioned by Musk, of SpaceX and Tesla. The students have built a long, skinny metal undercarriage that levitates with the help of powerful magnets. Early next month, they’ll cover the structure with a bullet-shaped carbon composite shell designed to slip aerodynamically through a low-vacuum tube — like those pneumatic tubes used in drive-through banking. The low-vacuum tube decreases air resistance, which is one of the biggest drags on cars and trains, said Malachi Williams, a civil and aeronautical engineering major. “By reducing the amount of air, you decrease the amount of friction, and that allows you to travel at faster speeds,” he said. In late January, members of the 35-member team will drive the pod to Hawthorne, Calif., joining teams from across the world to find out which pod design has the right stuff to compete on a mile-long test track, pushed by a stripped-down Tesla Model S. The team’s pod is designed to withstand an acceleration from 0 to 55 mph in one second. “It’s a competition, but everyone’s enjoying the engineering challenge; there’s no real rivalry,” said C.J. Grijalva, a systems engineering major. 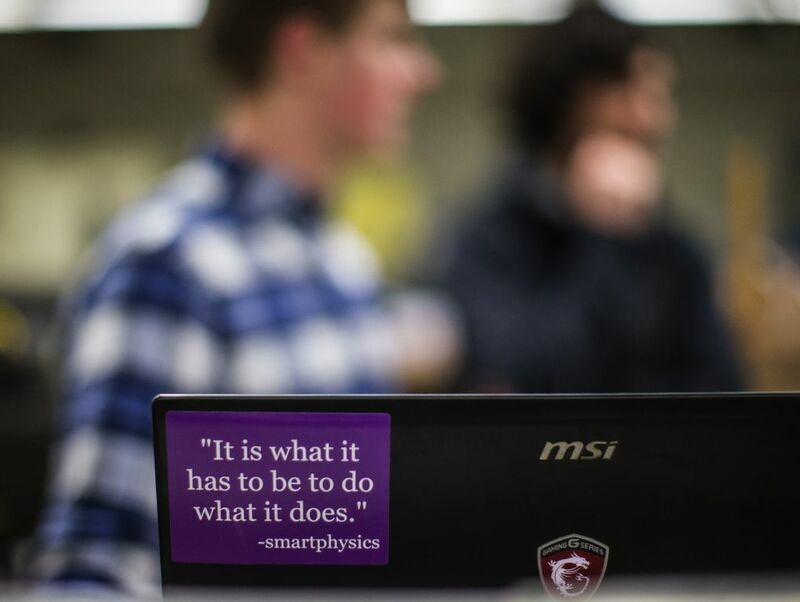 The UW Hyperloop team is the only Northwest team to make the cut, after SpaceX — the competition’s sponsor — took proposals from 1,200 teams in the initial round. The finalists were winnowed to 120, then 30. Other teams hail from U.S. engineering powerhouses such as MIT, Carnegie Mellon and University of California, Berkeley, as well as universities in Canada, Spain, Germany, Australia, India, Japan and the Netherlands. The competitors also include a high school in Texas and a non-student team organized on Reddit. The competition has been all consuming, with students working into the night, and chipping in their money for supplies and equipment, as well as trying to drum up contributions from local businesses. They won’t receive class credit either — this is an extracurricular effort. There’s no way to know if any of their ideas will make it into a final design, but that’s not the only point of the competition. Working on the project could help these students snare jobs in the engineering industry, and gives them real-world experience in design and manufacturing. In effect, their pod is a great way to show what they can do. Musk, the entrepreneur behind Tesla and SpaceX, outlined the idea for the hyperloop in a white paper in 2013, but said at the time he had no plans to build it. Describing it as a fifth mode of transportation (after planes, trains, cars and boats), he embraced an open-source ethos by sharing his ideas, and said he believed it could be cheaper and faster than the bullet train proposed for California. He proposed a hyperloop that would run from Los Angeles to San Francisco, take about 35 minutes to cover the distance, and cost billions less than a high-speed train. It’s likely, though, that the United Arab Emirates will be the first country to build a hyperloop, and it could be up and running as early as 2020. The UW students say that in order to work, the system’s pods must be safe, aerodynamic and frictionless. One of the most difficult engineering problems is designing a braking system that would bring the pod to a rapid stop. The pod has wheels, for guidance, that are in use when the pod is going too slowly to levitate. Much of their work is done using computer simulations, but the team also built a device they call the “meat slicer” — a disk that spins at speeds of up to 50 mph, allowing them to measure the effectiveness of various brake designs without needing a long track for testing. “We want to make sure everything works, and it’s safe,” Williams said. Williams has interned with SpaceX, and the students say one of the best things about the contest is their frequent conversations with SpaceX engineers to make sure their designs are on the right track. Last January, all the competitors met for the design phase of the competition, and the number of finalists was winnowed to 30. Musk made an appearance, and the UW’s pod won an award for the safest design. The team has a trophy signed by Musk. The average age of a SpaceX engineer is 26, Marcoe said, which was also the average age of NASA’s mission-control workers at the time of the first lunar landing. “The unique thing about our club is we’re very self-driven and self-motivated,” he said. Only a few engineering faculty members have gotten involved; the engineering work is student-driven. And that’s allowed the students to learn skills they wouldn’t ordinarily learn in a classroom — including project management, team-building and keeping everyone motivated, Marcoe said. The UW pod, one-quarter the size of a full-scale pod, is designed to go about 100 mph; the goal is to design, test, tweak, and design some more until the pod can travel more than 700 mph. That’s faster than a commercial airplane — but the pod won’t need to take off, ascend, descend and land. That would make the land-based system faster than flying, especially over distances of a few hundred miles. Musk also thinks a hyperloop system can generate its own energy through solar panels, making it the world’s most efficient form of high-speed transportation. In the beginning, the students planned to design the pod around a compressor fan, like the ones used in jet engines, and which Musk mentioned in his white paper. But it turns out they’re a bit pricey — about $1 million. Instead, the SpaceX engineers encouraged students to focus on making the pod as simple as possible, without worrying about the motor. A modified Tesla S will provide the power for the first round of trials. 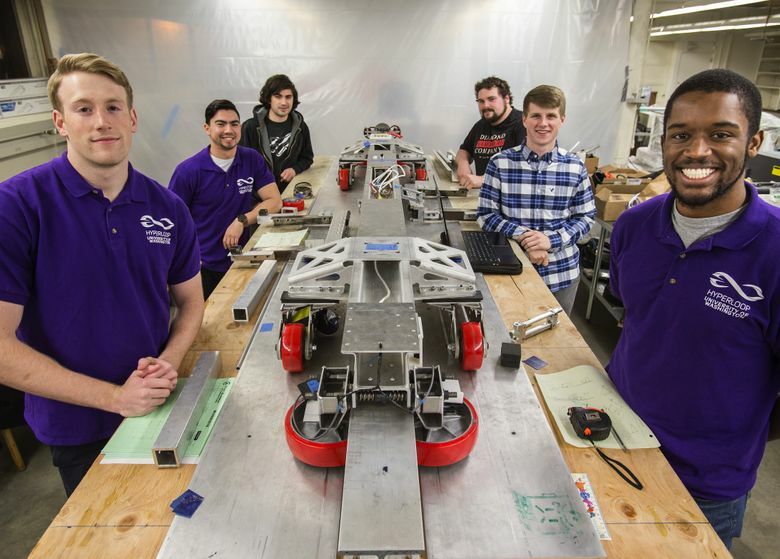 That led the UW team to the use of magnets, which create an eddy current on the surface of the aluminum track that lifts the pod off the ground when it reaches a certain speed, causing it to levitate. This isn’t the only collegiate team from Washington participating in engineering competitions designed to help them explore unconventional ideas and learn real-world skills. The UW and a Western Washington University team have been competing in the Formula SAE racing car competition for dozens of years, and the UW also has a team participating in EcoCAR3, a multiyear competition to build an advanced hybrid-electric car. Earlier this year, engineering students at Washington State University’s Everett campus came in second in an international robotics challenge to build a Mars rover. And in 2010, WWU students reached the finals of the X Prize competition to build a car that got the equivalent of 100 miles per gallon. After the college hyperloop test next month, a second competition for existing teams and new ones will encourage the students to design for maximum speed in summer of 2017. Marcoe says the competition will be biannual, and could go on for years, as the EcoCar challenge has done. The students say the hyperloop is a vision of the future that could change the very way we live and work.